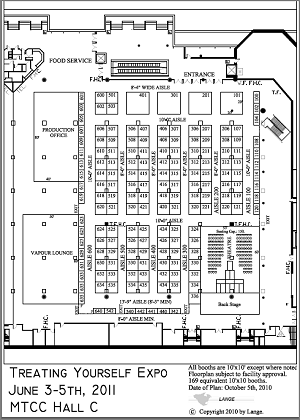 Home Page | For Exhibitors | For Attendees | 2011 Features | Exhibitors List | Contact Us | Get Tickets! This will be Canada's second annual expo promoting the respectable and responsible use of marijuana as medicine. To be held at the Metro Toronto Convention Centre June 3 - 5, 2011. Order tickets online securely with your visa or mastercard, via our secure payments page. If you suffer from health issues, this is a great show to visit for education and information about the variety of conditions that medical marijuana can treat. Marijuana as a health therapy has been used for thousands of years by people all across the world, this is the first Canadian expo dedicated to exploring the medicinal use and benefits of the cannabis plant. The show will feature hundreds of vendors from all over the world who specialize in the medicinal use and production of high-quality medical marijuana. Come to the show and meet patients who are legally entitled to consume marijuana as a medicine for a variety of conditions, and learn more about how to access the federal exemptee program for medical marijuana users. I look forward to seeing you in Toronto in 2011! Read our letter of Introduction. Metro Toronto Convention Centre, North Building, Hall A.